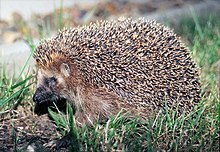 (US) Any of several spiny mammals, such as the porcupine, that are similar to the hedgehog. A type of moveable military barricade made from crossed logs or steel bars, laced with barbed wire, used to damage or impede tanks and vehicles; Czech hedgehog. 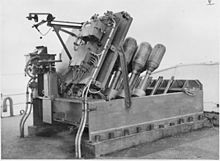 (informal, military, historical) A spigot mortar-type of depth charge weapon from World War II that simultaneously fires a number of explosives into the water to create a pattern of underwater explosions intended to attack submerged submarines. (Australia) A type of chocolate cake (または slice), somewhat similar to an American brownie. There are hedgehogs with sultanas as well as breadcrumbs, carrot cakes and fruitcakes and banana walnut loaves. I am so flustered that I order a vanilla slice instead of hedgehog. His wife had made a hedgehog cake and he offered some but Murphy refused – his mouth was so dry with terror he couldn′t swallow. A form of dredging machine. The first machines merely loosened, but did not raise the stuff, a scouring being afterwards effected by means of sluices. These machines consisted of large bars or prongs placed vertically in a frame, and being fastened to a barge placed in the line of the sluices, the whole was inpelled forward by the current, thereby scouring the bed. Such a machine, called a hedgehog, is still used in Lincolnshire. 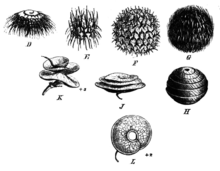 Medicago intertexta, the pods of which are armed with short spines. Retzia capensis of South Africa. 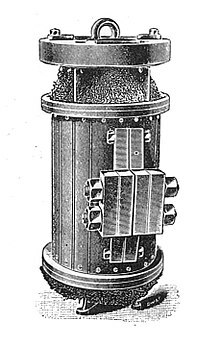 A kind of electrical transformer with open magnetic circuit, the ends of the iron wire core being turned outward and presenting a bristling appearance. A way of serving food at a party, consisting of a half melon or potato etc. with individual cocktail sticks of cheese and pineapple stuck into it. (military) To make use of a hedgehog barricade as a defensive maneuver. Hedgehogging means — let us call a spade a spade — that we're were encircled: It's something that has been forced upon us, a predicament from which we ought to try to escape as fast as possible. Luettwitz hedgehogged his regiment and held his positions until the rest of the division arrived two days later. During the night of May 27 the 90th Light Division hedgehogged south of El Adem. To array with spiky projections like the quills of a hedgehog. All around were styrofoam cups hedgehogged with butts, and the threebar electric heater was encrusted with bits of charcoaled tobacco and frazzled stands of hair where people had stooped down to spark up. The walls were pockmarked with fragments of stone and hedgehogged with jagged daggers of glass, while in the street below there were sickening splodges on the pavement which a workman was covering with sawdust. I think they're from different faculties,” I reply, taking a step back to peruse the table filled with assorted snacks, my hand hovering over the hedgehogged tray of cheese and pineapple cocktail sticks. To curl up into a defensive ball. You try for his head, but he's hedgehogged round now, elbows beside his ears and you can't get him. I stayed hedgehogged in my ball, listening for movement and trying to ignore the cramp in my legs, the ache in my gut and — encore — the throbbing in my temples. The dead man was lying on a pile of the blankets, curled up, his hands interlocked behind his head, knees drawn up to his chest. Hedgehogged, just like the others.